The busy 7th/Metro Center Station served by the Blue and Expo Lines on the upper level and the Red/Purple Line subway on the lower level. The Metro Blue Line opened on July 14, 1990. Here’s the link to part one of our big anniversary Q&A. Will Metro Rail ever connect to LAX in some sort of humane fashion? We all know that the Green Line infamously missed getting to the airport for both political and financial reasons. To put it lightly, there are people around our region who believe that was the most incredibly shortsighted epic fail of a blunder in the entire history of the known universe. But things have changed. For the better. The Metro Board of Directors — the agency’s ultimate deciders — in 2014 approved adding a station along the Crenshaw/LAX Line at Aviation and 96th Street, where Metro Rail passengers will be able to transfer to a new people mover to be built by LAX. The people mover will travel to three stations adjacent to the LAX terminals, as well as a consolidated rental car center and a new ground transportation facility. LAX officials have said they hope to complete the people mover by 2023. The people mover’s route. The ‘M’ shows the station that will connect with the Crenshaw/LAX Line. Source: Los Angeles World’s Airport. So how will people in downtown L.A. get to LAX one day? They will take a westbound Expo Line train and transfer to a southbound Crenshaw/LAX Line train at the Expo/Crenshaw Station. What about getting to LAX from the Purple Line subway? An extension of the Crenshaw/LAX Line north of Exposition Boulevard is in Metro’s long-range plan but is not funded, nor has any real planning taken place for such a project. A feasibility study was done in 2009 that looked at how a train may travel further north to the Purple Line subway and perhaps beyond to West Hollywood, Hollywood and the Red Line. To emphasize: while such a project is on Metro’s long-range radar, there isn’t money to build it at present. Stay tuned as to whether that will change. What’s the point of building rail if people have a hard time getting to the stations? 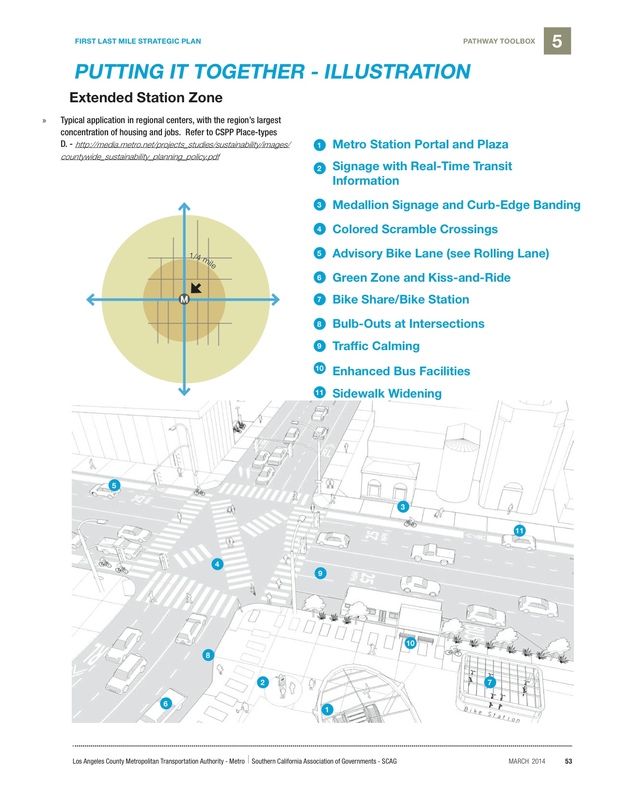 A page from Metro’s first-mile, last-mile plan. Click to see larger. The first-mile/last-mile issue is a challenge in L.A. and many places with transit — especially where rail is relatively new. While parking is appropriate at some stations, there are other places where there is little or no room for lots and/or garages. In addition, money is always an issue — it becomes very cost prohibitive for Metro to acquire property to build more parking that must, in turn, be maintained. Two interesting examples: there will be considerable parking at Gold Line Foothill Extension stations in the more suburban communities of Arcadia, Monrovia, Duarte, Irwindale and Azusa. Conversely, there will be no parking built as part of the Purple Line Extension subway which is mostly following the already very densely developed Wilshire Boulevard. 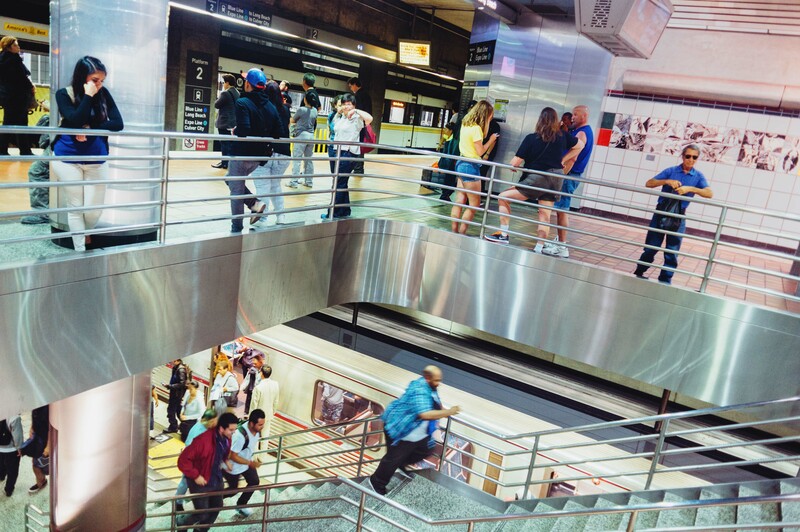 In response to these kind of challenges, Metro developed a first-mile, last-mile plan that provides all sorts of ideas for local cities about best connecting neighborhoods to rail stations. It’s basically a toolkit for local planners. I think that’s a good step forward and helpful to other cities who already feel the urgency to build better sidewalks, more bike lanes and put development where it best belongs — near transit! Wait. Are you seriously going to write a piece about the 25th anniversary of the Blue Line and Metro Rail without mentioning, well, the Blue Line? 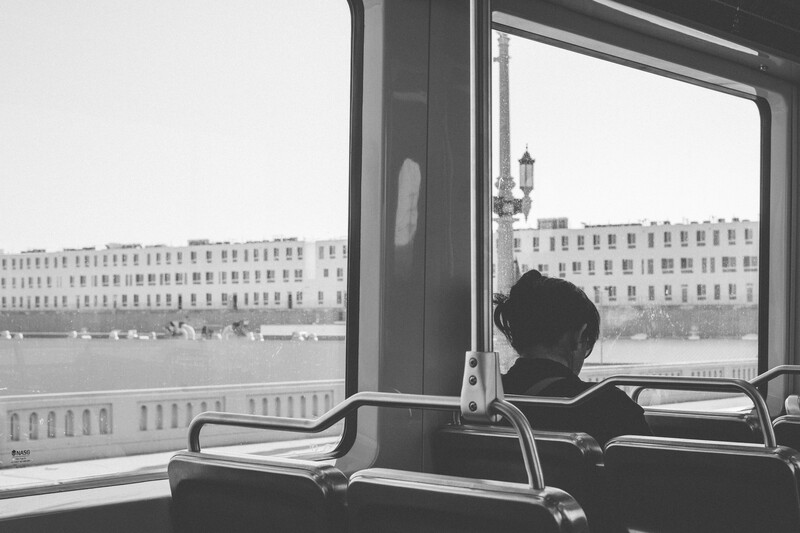 Aboard a Blue Line train in South L.A. in summer 2014. As everyone knows, the Blue Line has been involved in accidents in the past 25 years that have resulted in injuries and fatalities. Numerous safety features have been added to the line since it opened that have helped reduce — but not eliminate — car-train accidents. Suicides have also been a problem; Metro launched an ongoing partnership with the Didi Hirsch Mental Health Center in 2013 to raise awareness of the issue and install signs with the Center’s phone number at all Metro Rail stations. We wrote a lot about these issues back in 2011 and I encourage you to take a look at our four-part series. One other perspective I would like to provide about the Blue Line. It’s often overlooked that the line has been a mobility workhorse with the highest ridership by far of Metro’s four light rail lines (typically in the 80,000 to 90,000 average weekday boardings) in recent years. 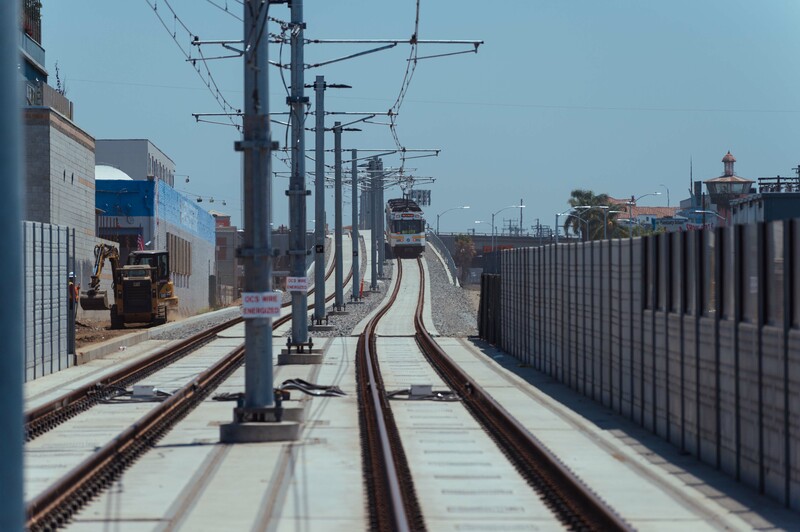 The line has improved access to jobs, schools, medical facilities, shopping, sports, culture and entertainment, in particular to residents in Watts, Compton and other low-income communities. The fact that it’s so busy and well-used is one reason behind the current project to refurbish stations, tracks, rail cars and more. 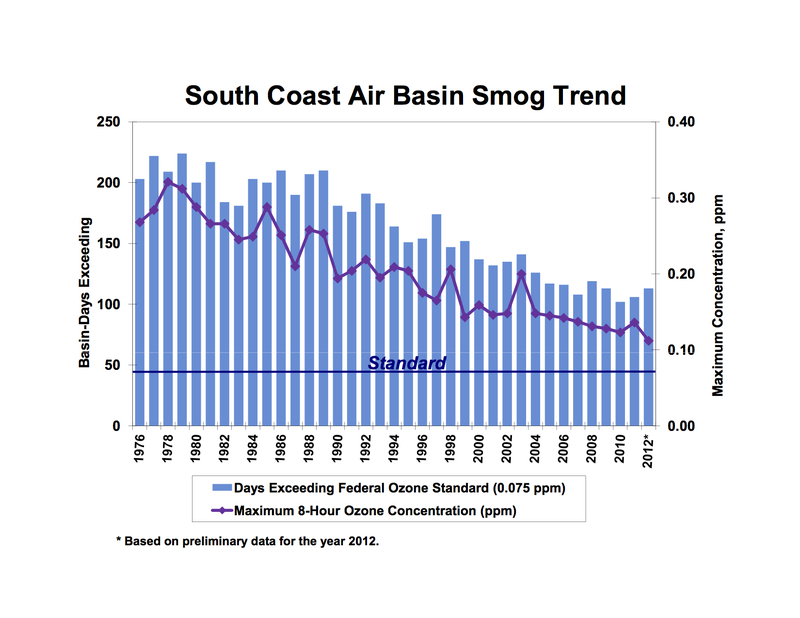 Does Metro Rail benefit air quality and does it reduces greenhouse gases responsible for climate change? There are a lot of reasons for the improvements — one of the foremost being better fuel efficiency and emissions controls in all sorts of vehicles. Keep in mind that smog has decreased even as the number of cars on our roads has increased. Bottom line: improved emissions in cars has gone a long way — and getting cars off the road helps. In 2013, Metro achieved GHG displacement of approximately 475,269 MT CO2e by shifting passengers from vehicular travel to transit (Table 1). This alone results in more GHG emissions displaced by passengers not driving than by all of Metro’s operational emissions. In plain English, that paragraph is saying that transit still relies on fossil fuels to move people. But transit — in particular rail transit — burns those fuels more efficiently by carrying more people than, say, the average car with a single passenger. I could throw some big numbers at you that sound good but probably don’t mean much. Suffice it to say that while trains and buses certainly burn fossil fuels, they can also carry a lot more people than cars and thus on average use fuel more efficiently than single cars. Something else to chew on: Metro Rail is powered by electricity. As the sources for electricity become cleaner and more renewable sources are used, the amount of greenhouse gases generated indirectly by trains will decrease. Has Metro Rail attracted new development near stations? The large One Santa Fe development in DTLA’s Art District, as seen from a Gold Line train. In the past decade, 2,017 housing units have been built in joint developments on Metro-owned properties; another 570 units are either under construction or in the negotiating phase. These developments typically take place on parcels that Metro purchased for transit project construction. A statistic that has been more elusive: the total number of units built near Metro Rail stations. That said, there’s plenty of anecdotal evidence that there has been significant development and/or redevelopment in communities served by Metro Rail, including downtown Los Angeles, downtown Long Beach, Hollywood, North Hollywood, Koreatown and Pasadena, where hundreds of apartments and condos have opened near the Gold Line (we’ll have more on this soon in a separate post). After years of almost no growth whatsoever, there has also been considerable development in downtown Santa Monica in preparation for the arrival of the Expo Line. New developments can also be seen by the Culver City Expo Line station. Real estate is obviously influenced by many factors and let’s be fair: there almost certainly hasn’t been as much development near some rail stations as some would like to see. This is a bit of a tricky area for Metro — it’s local cities, not Metro, that controls the zoning around transit stations. Los Angeles had one of the most extensive rail systems in the world. That infrastructure helped to shape the County as a denser region than its neighbors, whose development histories are more closely tied to the automobile. [Our first analysis] shows that recent patterns of development in Los Angeles County have not been substantially altered by transit infrastructure. Even so, these results do not preclude a greater shift in development patterns toward transit in the future. Los Angeles’ modern rail system has existed for only 20 years, a relatively short period in the development history of American cities. The rail and bus rapid transit system has expanded rapidly in that time and will continue to expand rapidly…With this expansion comes an opportunity for greater recognition of the value of high capacity transit among Angelenos. When residents, employees, and employers place more value on proximity to transit, developers will place more value on proximity to transit also. What is the significance of the Regional Connector? Great question as it’s an important project. The Regional Connector is a 1.9-mile underground rail tunnel that will connect the Blue and Expo Line tracks that end at 7th/Metro Center to the Gold Line in Little Tokyo. Under the current operating plan, light rail trains will run from Santa Monica to East L.A. The other set of trains will run between Azusa and Long Beach. 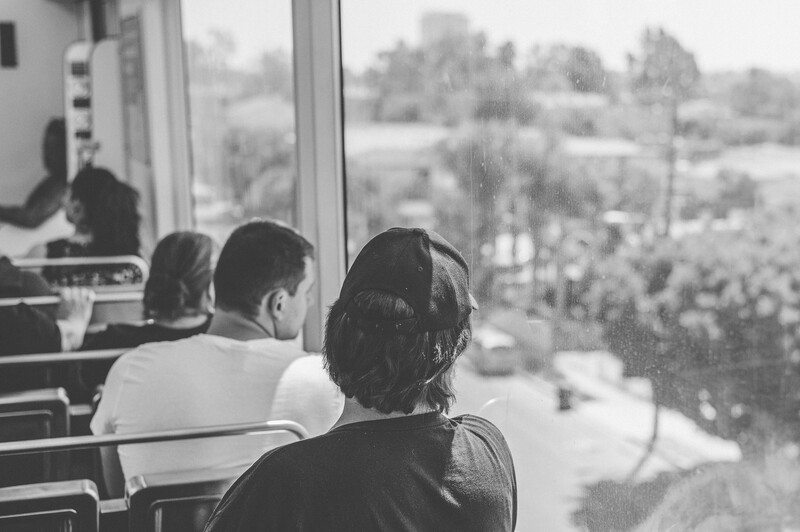 The two lines will share tracks in downtown L.A. The obvious benefit: many Blue and Expo Line riders won’t have to transfer at 7th/Metro to reach destinations farther north in DTLA. Likewise, Pasadena and Eastside Gold Line riders won’t have to transfer at Union Station to reach the heart of DTLA. The new configuration will also save time for many passengers riding through DTLA. What will the rail lines be called after they are joined together? Hasn’t rail ridership slipped a bit lately? Why? Longterm ridership has climbed steadily since Metro Rail first opened in 1990. There has been a dip in the past year, according to the ridership estimates posted by Metro. I don’t think there’s any one reason but it’s likely a combination of factors: maintenance programs and reliability issues that have impacted service on all the lines (and especially the Blue Line), an ongoing crackdown on fare evasion and the fare changes and increases that went into effect in fall 2014. Interesting point about the fare changes: while the price of a regular fare increased from $1.50 to $1.75, Metro also began allowing two hours of free transfers instead of requiring riders to pay a full fare every time that transferred. That means the cost of riding actually went down for some customers — in particular the ones who may only make a round-trip in a single day. My hunch is that ridership numbers will rebound when maintenance work on the Blue Line and Red/Purple Lines is completed. In short, yes the maintenance work is a pain. But it’s also a fact of life — everything needs to be maintained, whether it’s your body, your home, your car, a freeway, etc. Some of the rail cars in use have been around for a while. Are there new cars on the way? Yes! Metro has ordered 175 light rail vehicles from the firm Kinkisharyo, which is assembling the cars at a new facility in Palmdale. The light rail vehicles will be used on the Blue, Crenshaw/LAX and Gold Lines. The 78 vehicles that are in the base order are forecast to be delivered to Metro by January 2017. Metro is also in the early stages of planning a procurement for new subway vehicles that will be needed when the first section of the Purple Line Extension opens. Will there be underground cell phone and wifi service on the rail system? Yes. Metro has hired a contractor to install cell service throughout the subway tunnels and wifi in station areas. The work began earlier this year in downtown Los Angeles although the schedule has slipped due to ongoing negotiations between Metro’s contractor, InSite Wireless, and wireless carriers. What will Metro Rail ultimately do for our region? If predicting the future was easy, everyone would be doing it. And getting it right. The freeway system in our region — while often clogged — still manages to work because it’s a network. The freeways and roads across L.A. County are connected, allowing people to travel to pretty much anywhere they want to go. Pretty much every home in the county is on the road network. So no surprise that cars are — and will likely remain — really popular. Whether self-driving or not. We also have a big bus system across the county, especially if you look at the Metro bus network combined with buses run by individual cities. The big challenge, of course, is that buses must share the road with regular traffic and there has been little appetite in our region — and most other parts of the United States, really — to set aside exclusive road space for buses. And that’s the point of the rail system. It provides us with something that was missing for most of the latter half of the 20th century in Los Angeles County: high-frequency, high-capacity and faster transit service capable of moving people long distances. Trains help move a lot of people in other cities across the globe and there’s not one viable reason that can’t happen here. We’ve already seen development in parts of our rail corridors and as time goes by, it’s very likely we’ll only see more of it. Our rail network is certainly growing. But it’s not quite yet a complete network and there are still still big holes to fill. The number two job center in L.A. County — the Westside — is still not yet on the rail network, although it will be soon when the Expo Line opens and serves the media gulch part of Santa Monica. I know it’s hard not to be impatient as the system grows. I also think it’s very easy to be skeptical about efforts to get people out of their cars in a place often called the car capital of the world. Cars in our region are almost certainly not going anywhere, but I think our region has become sophisticated enough to realize cars can’t and won’t do it all. Things change and they’ll keep changing. Anniversaries are nice, but the most exciting part of Metro Rail, I think, will be what happens in the next 25 years. An Expo Line test train on the tracks east of Barrington Avenue in West L.A. in June. How about touching on one more missed piece of more interconnectivity, specifically the Green Line to Norwalk Metrolink station, which has initial planning in place. OFF TOPIC: Well, hi Steve. I just inquired about you yesterday. Hadn’t seen any posts by you for a few weeks and thought maybe you may had been on vacation or moved on. Welcome back. Great summary. I know the Blue Line refurbishment is nearly complete, but is there any type of general estimate for the completion of the Red/Purple Line work? It has been ongoing for a very long time now and doesn’t get a lot of press. Thanks. If the map of the LAX people mover is accurate; it looks to be that there is one station serving the passenger area of LAX. Passengers with luggage can not walk that far. Will there be shuttles available to take passengers to the people mover station in LAX? There are 2-3 planned stations in the terminal area. I’m not sure what everyone else’s airport experience has been, but the proposed layout seems to compare favorably to other people movers I’ve been on. I hope whoever designed and released that conceptual drawing of the People Mover/Intermodal Transportation Facility/Rental Car Center has nothing to do with the actual design tying the Crenshaw line into the People Mover (the logo in the upper left corner of the picture tells me all I need to know). You couldn’t provide less information if you were actually trying to. 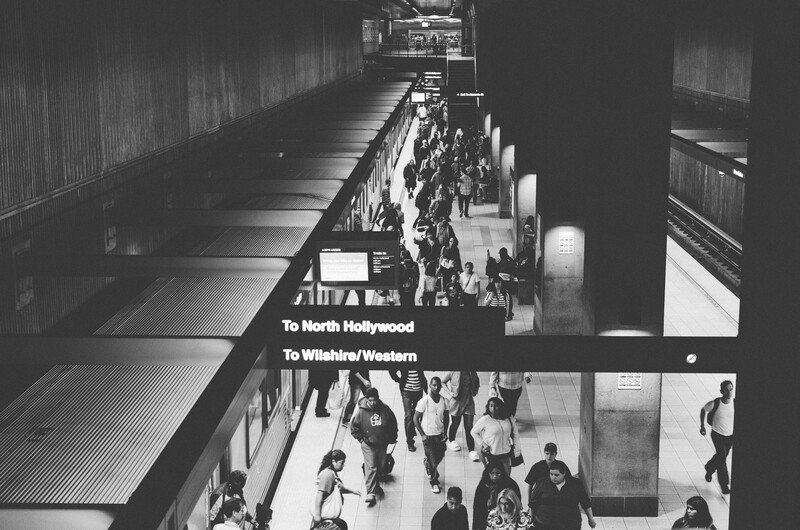 Do us a favor and include the Crenshaw line next time will you? And, oh yeah, actually ride the lines before you sit down and try to consolidate them. As one reader said, trying to get accross expansive stations and in and out of elevators with 4 pieces of luggage, on foot, will ensure that this project is doomed from the start. A recent trip brought another rail station deficiency to light – the new turnstiles are impossible to get luggage through! Perhaps Metro will spend some more of Other Peoples Money to change the design at major interconnecting stations. Idea – the luggage could be slid over the fence on a specially designed ramp. By contrast BART uses a small door that opens with a Star Trek style ‘whoosh’ and then closes when an optical sensor determines that the patron and his luggage have passed. We can just get rid of turnstiles which are ANCIENT technology by today’s standards and move toward more modern fare gates. 2. One that is left open and only closes when someone does something wrong (the gates situated at both ends of the gates). This is more common in Asia. 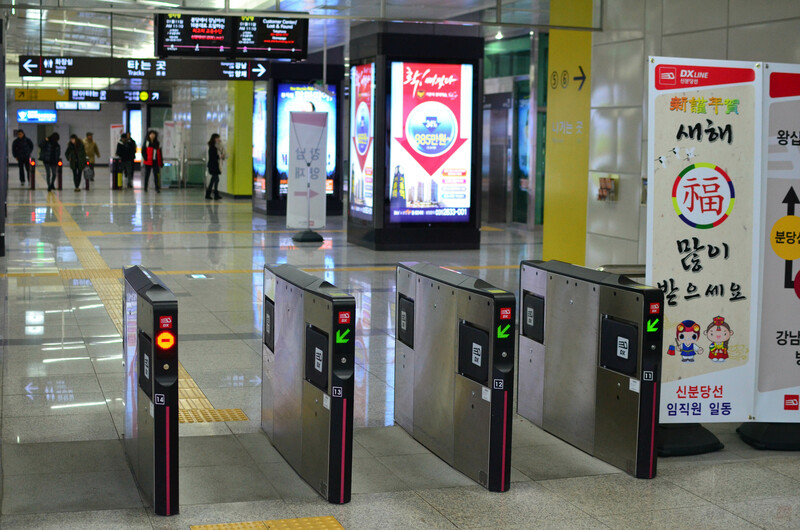 I personally prefer the Tokyo and Seoul faregates. Wide enough for both wheelchairs and those with luggage to pass through, gates left open to speed up human traffic, but only closes to shut them out from entering/exiting the system to those that try to cheat their way in. This solves both problems of ensuring people to go through no matter what disability they have or whatever luggage they are carrying, and will keep fare evaders out of the system because once they try to go through, the doors slam shut in their face. Thanks for the great write-up, Steve. These are exciting times for Metro rail riders. In regards to the regional connector, I hope some of the trains from Pasadena head to Santa Monica rather than Long Beach. I can’t imagine why they wouldn’t be able to. In your explanation of the possible reasons for the decrease in rail ridership you left out one important factor: fuel prices. The lower fuel prices experienced for the last two years coincided with a decrease in both bus and rail ridership. Metro Bus ridership has fallen by approximately 6 percent, and Metro Rail ridership has fallen by approximately 8 percent during the same time frame. This indicates that only a small portion of the decrease in rail ridership should be attributed to variables specific to the rail system (e.g. fare enforcement and maintenance issues). 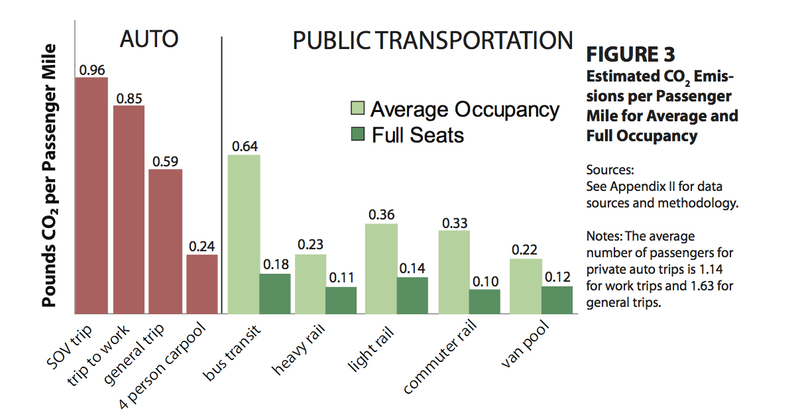 Another factor to consider about lower ridership numbers: how many transit riders did you lose from the short distance travelers with the recent fare hike? A fare hike of $1.75 per ride/$3.50 roundtrip is still a great deal if you’re going from Long Beach to 7th/Metro. A fare hike of $1.75 per ride/$3.50 roundtrip is not a great deal if you’re going from Florence to Vernon. The demand for going from working class communities to factory jobs in Vernon are higher. But if it costs the average factory worker $3.50 per day just to do a roundtrip for a two station trip, the far more likelihood is that they’ll just look toward something cheaper than the Blue Line, like perhaps the bicycle or carpooling with their fellow factory workers.